Sift the icing sugar and almond meal into a bowl and mix to combine. Set aside. Place the eggwhites and food colouring in an electric mixer and whisk on high for 30 seconds. Add the caster sugar and whisk until stiff peaks form. Fold through the almond meal mixture in two batches until smooth. Place the mixture in a piping bag fitted with a 1 1/2cm plan nozzle and pipe 4cm rounds onto baking trays lined with non-stick baking paper. 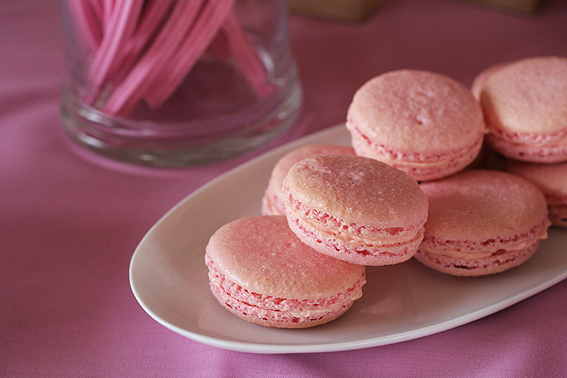 Allow to stand for 20 minutes or until a “skin” forms on top of the macarons. Reduce temperature to 130 degrees Celsius (260 degrees Fahrenheit) and bake macarons for 17-18 minutes or until crisp on the outside and moist in the centre. Allow to cool completely on trays. Spread half the macarons with your chosen filling and sandwich the remaining macarons. Oooo.. i like this recipe, it sounds so much more easier to achieve. Definitely going to use this for my next attempt. It’s in the current issue of Donna Hay if you want to grab a copy! I think my first attempt I totally over-complicated the whole thing – making my own almond meal and worrying about the egg whites being left out for a day etc. This time I kept it simple and success!